The Providence Homes Team is putting the finishing touches on our newest Move-In Ready Home at Durbin Crossing South. The 2548 sqft 4 bedroom 3 bath French Country design at 103 Stirlingshire Court is located on a conservation home site in a cul-de-sac home site. The Lot 16 Move-In Ready Home includes a formal Dining Room, Study, Family Room, Play Room, Kitchen/Café and covered patio. Interior appointments include ceramic tile in Foyer, Kitchen/Café, Family Room, all Bathrooms and Laundry Room. The kitchen features upgraded cabinetry, granite countertops, GE Stainless Steel appliances with microwave that is vented to the exterior. This home is Energy Star Certified with a 5 Star Plus Rating that estimates a $132.00 total monthly energy bill. Durbin Crossing South is an extraordinary community located in the very desirable St Johns County school district. 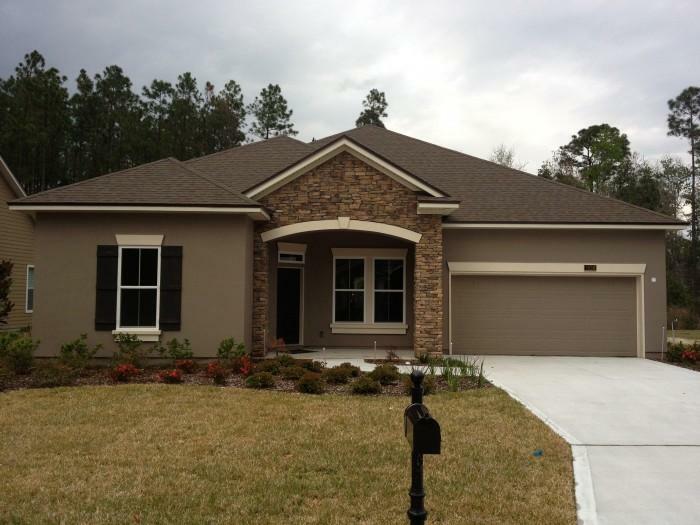 Only minutes from I-95 Durbin Crossing has consistently been one of the top selling communities in Northeast Florida. For additional information contact Tracy Stout at 904-271-1223.